The concept of a laparoscopic approach to the treatment of prostate cancer is not new. In the early 1990s Schuessler et al described the laparoscopic pelvic lymph node dissection. 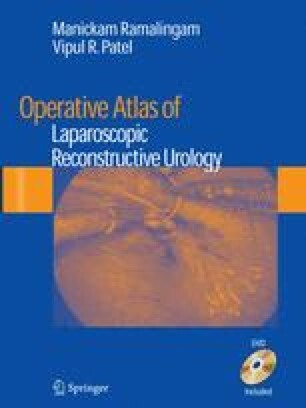 Later, in 1992, Kavoussi and Clayman joined this group to describe their first successful laparoscopic radical prostatectomy (LRP) . The early results were less than promising, with prolonged operative times and no major advantages over conventional surgery . However, in the late 1990s the procedure was revived as European surgeons reevaluated LRP and reported its feasibility, with results comparable to the open surgical approach [2,4-7,10]. Despite this, a lack of widespread acceptance and utilization of LRP has been observed, partly due to the steep learning curve of this procedure. Even in the hands of experienced laparoscopic surgeons the technical challenges imposed by the limitations of conventional laparoscopic instrumentation are formidable. Potential difficulties include lack of depth perception with a two-dimensional laparoscopic view, counterintuitive motion, and non-wristed instrumentation limited to only four degrees of surgical freedom.